VR has already been adopted by businesses worldwide and AR is slowly following suit. It may seem too far-fetched for many business leaders today to imagine that employees will be using Augmented Reality (AR) to present to the board of directors and Virtual Reality (VR) to hold meetings with colleagues around the world in the next five to ten years. Whilst this might sound like the start of a science fiction film, the scenarios above are not as outlandish as they may seem. In enterprise, VR is already being widely used by companies in the UK and around the globe. From empowering teams to work more efficiently to generating new, creative approaches for achieving business objectives and increasing collaboration. The benefits that VR is currently bringing to the world of business is huge. To a lesser extent, AR is also beginning to play an important role within companies at this current time. However, both VR and AR are developing at an extraordinary rate, and the potential that they present to businesses and employees alike is immensely exciting. AR and VR are truly the transformers of future enterprise. Forward thinking business leaders should absolutely see VR as one of the most important tools for collaboration in their company today. Conference lines and newer enhanced technologies such as iMeet, which enable you to share your computer screen with other colleagues remotely, are becoming standard tools in the office of leading businesses. Yet, these are in themselves early examples of VR in office action. Rather than needing all team members to be together in the same location, VR tools enable colleagues to collaborate and communicate face to face at anytime, anywhere in the world. This removes many barriers that stand in the way of teams working to their optimum efficiency, which ultimately means that a business’ bottom line is less likely to be jeopardized. The very essence of VR, and the driving force behind its impact on enterprise, is about bringing people together to collaborate. From picking up the phone to make a conference call to using an app to share documents securely, it is the level of interaction through these collaborative technologies which is already helping businesses increase efficiency. Positive collaboration is essential for building successful business in this day and age. So, in this way, we can already see the benefit that VR is bringing to enterprise. To be honest, the vast majority of people think of the AR headsets, like Oculus Rift or the Snap Glasses as a novelty – something that only the extremely rich can afford to play around with. Transporting a lucky few to the outer galaxy and helping influencers add to their Snapchat story with greater ease doesn’t instantly scream business tool to executives. However, headsets such as these will bring real value to enterprise. Presentations today can be a dry affair and not all of the information participants need is always available at the time of the presentation. But imagine if you were wearing AR glasses or contact lenses that could bring up additional supporting information that only you can see when you look at the presentation. This could be the catalyst that allows you to make better informed decisions to move faster and get competitive advantage. This isn’t as far-fetched as it sounds and AR could take us here in the next five years! In industries such as manufacturing or maintenance which require huge amounts of technical knowledge, AR will really come in to its own and provide, in some cases, invaluable support. Imagine a real-life example where a mechanic was out on a job to fix a car on a remote road. As they look at the engine and check the fuel levels, the headset could flash up relevant and potentially lifesaving information such as fuel and temperature levels. The headset could also bring up helpful user guides specific to the particular type of car they are servicing. This service will not only be extremely beneficial to the mechanic on the scene, it will also help the car break-down company in terms of improving their efficiency in dealing with such scenarios. Another example could be where a police bomb disposal unit is deployed to neutralise a suspicious package in a busy city. As the officer approaches the package, the headset could flash up relevant and potentially lifesaving information such as temperature levels, chemical analysis and even information on how to neutralise that specific type of bomb. Through using the AR headsets, it will not only help the police in terms of improving their efficiency in dealing with such scenarios it will also be extremely beneficial to the policeman on the scene. 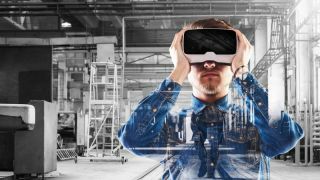 Whilst we are already using basic forms of VR in the workplace, we will see substantial advances in its adoption and complexity over the next five or so years. One industry that is already utilising VR at a level ahead of other sectors is property. As digital transformation in the property sector intensifies, and agents and landlords move their services online, some have started to incorporate VR into their platforms to attract the modern renter and home buyer. Consumers are seriously time-strapped and have limited time to visit properties whilst hunting for their next home. Through using VR, estate agents can show prospective buyers or renters ‘virtual’ live tours of properties, meaning the consumer never has to leave their sofa to view a property. Ultimately, this will streamline the property industry which could enable more transactions to take place, meaning the consumer gets a new home with greater ease and the agent’s bottom line is improved. Since the turn of the 21st century there has been an overwhelming level of technological innovation and transformation. Whilst we can see early examples of VR embedded in the everyday office, and they are not likely to disappear any time soon, there is still so much more that this technology has to offer. With AR, we have yet to see the real value that it will bring to enterprise, but there is no doubt that this is set to change imminently. The opportunities that AR and VR present for the future of global business are incredibly exciting – not only in terms of enabling teams to collaborate with greater ease, but also in providing the catalyst for teams to achieve greater things than ever before.